San Miguel Peak lies very near the triple divide of Dolores, San Miguel and San Juan Counties, about 12mi south of Telluride. 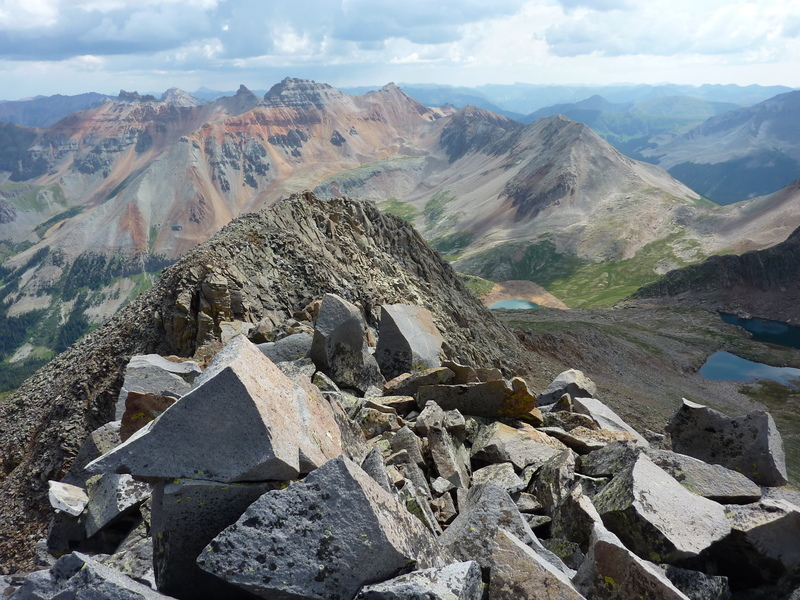 The peak sits about a mile southwest of Hope Lake, an incredibly popular hike of about 2.5mi each way. Eric and Steve signed up to hike as far as the lake, leaving me to do the peak climb on my own. We drove to the TH in two cars to allow the others to leave early for a visit to a hot springs near Rico. Coming on the heels of our Sneffels climb, they'd had enough of summits and were looking for a more relaxed day and this seemed to fit the bill. The road to reach the TH starts from SR145 at the turnoff for Trout Lake, initially paved but becoming maintained dirt for the last several miles. Most vehicles should be able to reach the 10,700-foot trailhead despite water puddles and some potholing. There were only a few cars there when we arrived just before 8a, but it would be overflowing by the time we returned in the early afternoon. Under clear skies, we spent about an hour and a half to hike the trail to Hope Lake, passing a few parties along the way. The trail is well-maintained and easy to follow as it makes its way mostly through forested terrain before eventually emerging above treeline to reach the lake at 11,800ft. I left the others once we reached the lake, following the northern shore around towards the dam to reach the start of the climb up to San Miguel. Eric and Steve found a cushy overlook on the north side of the lake where they spent an hour or more relaxing in the sunshine before heading back down. I started up the slopes on the west side of the lake, initially aiming for San Miguel's NE Ridge. I found easier going up grassy slopes on the east side of the ridge where I stayed until climbing onto the ridge proper for the last 400ft or so, over increasingly larger granite blocks. It was 11a when I reached the summit with the first clouds now making their appearance. They would not take long to coalesce into something more threatening. A PVC register held soggy and unreadable contents. It seems the more usual state for CO registers as those with dry paper appear to be in short supply.